Fridays are not a good day for coherent thought, I find. Or, at least, I have to save all of my coherent thought for work. So, I thought the Friday Fragments idea I found on Blogher was a great idea for today. Awhile back I made some shaving scrub for my daughter to use when shaving her legs, and she complained it was hard to see and said she wasn’t sure about it. The other night, though, she came downstairs and demanded that I feel her legs, then told me I should make some more scrub, because she has almost used it all. Score one for homemade! I am making good progress on my handmade gift list. I have 5 blankets and 9 scarves and several small stocking ornaments done, 1 blanket nearly done, and a shawl that is probably 75% complete. Oh, and several spa cloths! I haven’t made much progress on my aunt’s collage, but I have plans to work on that this weekend. 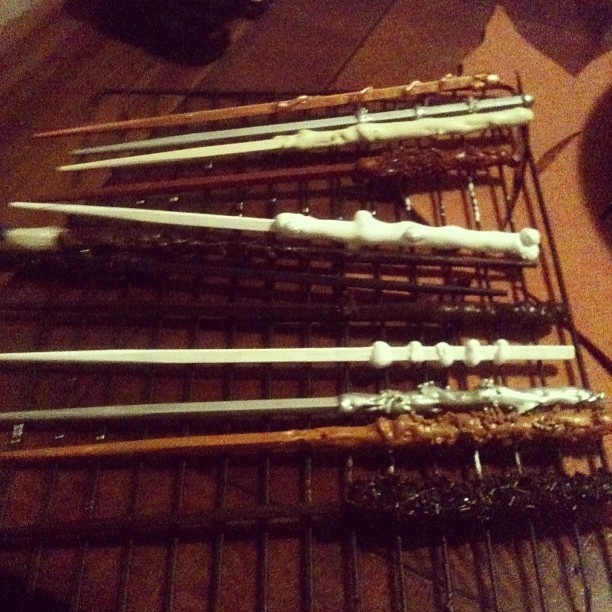 My son and I are going to make more wands this weekend for a Harry Potter party at a friend’s house. We did it last year and had so much fun. I should say we are going to make wands if I can find my glue gun. I really need to reorganize my family room into a crafting studio so I can find things. It is 49 degrees outside right now. The forecasted low is 43. This is important, because my daughter has friends over and they are sleeping in a tent in the backyard. Personally, I am glad to have my bed in the warm house. that’s all I can think of at this point. It is nearly bed time on Friday night, and I am glad to have made it through the week. How was your week? Any exciting plans for the weekend? Linking up to the current Friday Fragments post–check out the other fragmenters!